A female black bear and her three cubs were transferred to Oakland Zoo from the care of the California Department of Fish and Wildlife (CDFW) Wildlife Investigations Lab on Tuesday. Though it is CDFW policy not to place large adult mammals into captivity, a sequence of unique circumstances provided these bears an opportunity for a life as educational ambassadors at Oakland Zoo’s upcoming California Trail exhibit, rather than euthanasia for the sow and attempted rehabilitation of the cubs. In the early hours of Monday, May 15, the sow and cubs broke into a home in Pine Mountain Club in Kern County. The elderly resident of the home attempted to haze the bears by banging pots and pans to no avail. The sow charged and swiped at the resident, causing injury to her left arm. She was treated at a local hospital and is recovering. Per the CDFW public safety policy, a black bear that is known to have attacked or injured a human is deemed a public safety bear and must be euthanized. During the investigation, CDFW learned of eight other incidents in the same vicinity over the three weeks leading up to the incident involving a sow with three cubs, believed to be the same four bears. These incidents were not reported to CDFW. None of these incidents resulted in human injury, however the bears did significant property damage to vehicles, garages and homes. 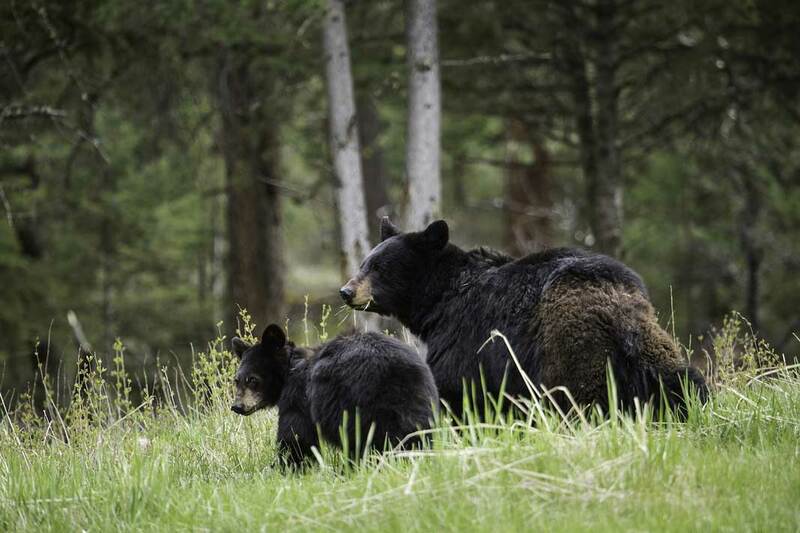 On the night of May 15, CDFW set a culvert trap in Pine Mountain Club and by the early morning of May 16, the sow and her cubs were safely captured. CDFW transported them to a holding facility at the Wildlife Investigations Laboratory near Sacramento. The cubs were approximately 12-15 lbs. and not yet weaned from the sow. CDFW decided to hold and monitor all four bears until the cubs were weaned, with the hope that the cubs could be rehabilitated and eventually returned to their natural habitat. As a known public safety animal, the sow was to be euthanized per CDFW policy. However as monitoring continued, CDFW staff determined that the bears were habituated to humans and not suitable candidates for release. CDFW began to search for a captive facility for the cubs. Oakland Zoo requested to take the three cubs, as well as the sow, for their 56-acre California Trail expansion, its focus to highlight California’s natural habitat as part of an initiative to emphasize native species and educate the public about human-wildlife issues. In the interest of the cubs’ well-being and outreach opportunity, CDFW supported this unique strategy of placing the sow into captivity. The exhibit, scheduled to open in summer of 2018, is intended to mimic California habitat, educate visitors about wildlife in California and inspire people to take action for the future of the state’s wildlife resources and habitats. Tuesday’s transfer of a sow, predestined for euthanasia, with her three cubs was highly unusual. No opportunity for transfer of a known public safety animal has previously existed. This situation is unique and does not set precedent for future outcomes for other habituated bears, public safety animals or nuisance wildlife. Additionally, captivity is far from an ideal outcome for a wild bear. The best outcome for these black bears would have been to exhibit natural, healthy behaviors in their native habitat, free of human-related attractants, wildlife feeding issues and eventual habituation. During CDFW’s investigation, Pine Mountain Club residents reported that the sow had been well known in the area for a couple of years and they believed this was her first litter of cubs. The sow was known to scavenge for human-related food sources, cause property damage, and was teaching her cubs how to enter vehicles and homes in search of food. As a result of habituation, these bears did not recognize how to search for or rely on natural food sources. Despite extensive public education and outreach in Pine Mountain Club about how to live in bear country, many residents are known to feed bears. Not only is feeding wild animals illegal, giving them access to human food and garbage cans causes them to lose their natural foraging habits and can make them aggressive. CDFW regularly educates communities about how to keep both humans and wild animals safe. CDFW will continue to reach out to Pine Mountain Club and surrounding communities to create bear-aware communities and prevent future circumstances like this. Learn more at www.wildlife.ca.gov/Keep-Me-Wild.